ActivePresenter has many functionalities for video editing, ranging from basic to advanced. In this tutorial, we will quickly walk you through how to split videos and join multiple videos into one. Step 1: Select a video and specify the timestamp where you want to split the video. 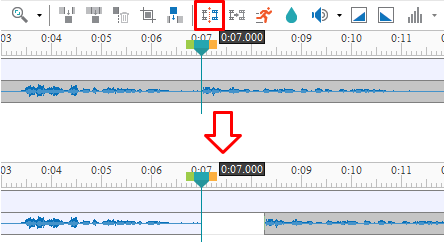 Step 2: In the Timeline pane, click the Split Audio/Video Objects button. The video will be split into two separate objects. However, the timeline still places the two objects in the same object line. Step 3: If you want to move the latter part to a new object line, right-click it > Move Up/Down into a New Line. Step 1: Select all the videos that you want to merge. Hold down CTRL or SHIFT while clicking to select multiple videos. Step 2: Click the Join Audio/Video Objects button. All the selected videos will merge together based on ascending order of their start time. It means that the video with smaller start time will play first in the combined video. A red mark shows where videos join. If videos have the same start time, ActivePresenter will sort videos by their z-order in ascending order. A video with a lower stack order will appear prior to the one with a greater stack order. If videos don’t have identical properties such as width, height, or resolution, the combined video will use all the properties of the first video that plays. In other words, the output video will apply all the properties of the video having the smallest start time. That’s it. So simple to split videos or join multiple videos into one with ActivePresenter. Hope that this helps.